The BC election is a month away (well one month and 1 day since it's on May 9th). It sure doesn't feel like it. I live in Vancouver and you couldn't guess we were about to enter the campaign (the writs will drop on April 11th). You have the occasional ads on tv or the radio but that's pretty much it. On my Twitter feed, only the Green seem at work. 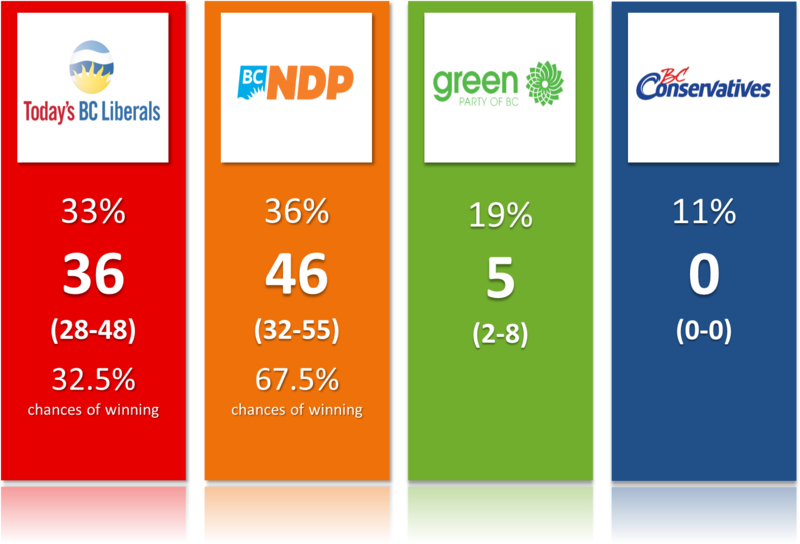 Anyway, the latest Mainstreet poll (literally the only pollster in BC for a while now... Hey Insight West and others, wanna maybe publish one or two polls?) shows a province pretty much divided in 3. The Green party is ruling on the island with 34% of decided and leaning voters. The BC NDP is ahead in the greater Vancouver while the BC Liberals dominate in the rest of BC. Province wide, we still have the NDP slightly ahead of the Liberals. Let's keep in mind however that there are still 23% of undecided, a number that hasn't changed in weeks. Given the strong economy and public finances, it's to be expected that a fair share of these undecided will ultimately go with the incumbent party. The Green are now at 19% (or 13% before redistributing the undecided) while the BC Conservatives continue to prove that you can get into the double digits (11% to be exact) without a leader or candidates (they have a couple but that's it). Mainstreet is literally wondering if they should continue offering this option. Anyway, my guess is that as the campaign begins, the BC Conservative will start collapsing. 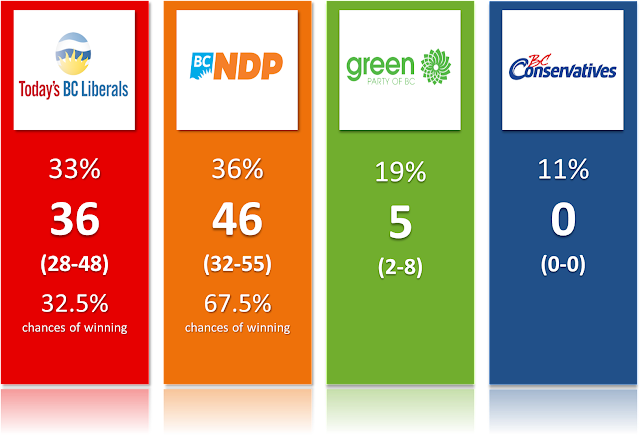 I don't currently average the polls but I'll start doing it next week as I'll set up the BC election 2017 page with all the polls, projections, etc. According to Mainstreet, if the BC Cons voters had to vote for someone due to a lack of candidate, they would go to the NDP 22% of the times, 11% would opt for the Liberals, 9% to the Green, 37% wouldn't vote at all and 22% are undecided. It might seem slightly surprising to see the BC Cons voters having the NDP as second choice, but I think we can rationalize this as seeing these voters as anti-Christy Clark or anti-BC Liberals. If John Horgan and the NDP are to finally gain power in the 21st century, they will need a lot of these voters. I mentioned last week that my model looked like it was overestimating the BC NDP on the island. I get the same result this week. I thus made some small adjustments to my model. I don't fully trust regional numbers because of the (sometimes ridiculously) small sample sizes, but I also recognize that BC elections often have weird regional swings and I have to account for them. The main effect of those adjustments is to change some seats from the BC NDP to the Green. My model is fine is the other regions (not spot on but quite close). Here below are the projections (including the detailed ones below). Not much change since last week.